Lama Sherab Dorje Rinpoche aka Rebkong Ngagchang Sherab Dorje (Tib. རེབ་ཀོང་སྔགས་ཆང་ཤེས་རབ་རྡོ་རྗེ་, Wyl. reb kong sngags chang shes rab rdo rje) was a yogi of Repkong Monastery in Amdo, Tibet, a main disciple of Dudjom Rinpoche, the uncle and one of the root masters of Lama Tarchin Rinpoche. He went to India as a refugee in the 1960’s. At this time, due to the fact that all yogis and ngakpas were having trouble with their dreadlocks adjusting to India’s humidity and sanitation (epidemics of head lice were rampant), Dudjom Rinpoche ordered all of them to keep their hair combed and tied back. Among all the Nyingma ngakpas at that time, Lama Sherap Dorje refused to give up his dreadlocks and kept them for the remainder of his life. In 1963, he came to Orissa (India) where Dudjom Rinpoche was building a Nyingma monastery called Duddul Raptenling, and was appointed the head of the monastery, after Chagdud Tulku Rinpoche. Lama Sherab Dorje Rinpoche’s nephew is Lama Tharchin Rinpoche. 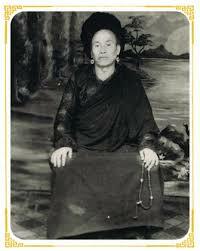 His son is Lopön Jigme Thutop Namgyal, whose mother is Pema Lhatso, a Tröma Nakmo practitioner from Pemakö in Tibet. This page was last edited on 13 February 2019, at 09:36.